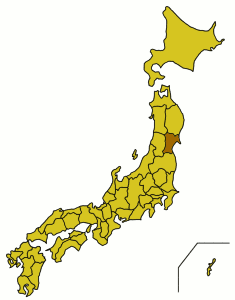 Miyagi prefecture (宮城県 Miyagi-ken) is in the northeastern Tohoku region of the main Japanese island Honshu. Miyagi prefecture has nothing to do with Mr. Miyagi from The Karate Kid (he's not even from Miyagi, but from Okinawa). Ishinomaki — An industrial and fishery port town, home to the Mangattan Manga Museum. There is also a very beautiful sawtooth coast line. Akiu — a hot spring town located in Sendai City. Kesennuma — Northern city in the prefecture where fishery market is famous. Delicious abalone, sea urchin, shark fin and various kind of fish are available. Kinkasan — Gold mining mountain just off the coast. Matsushima — A bay of craggy pine islands, traditionally considered one of Japan's Top 3 views. Naruko — hot spring resort deep in the mountains. Sakunami — small hot spring town located near Sendai. Tashirojima — This island is know as "cats island." All the residence on the island are taking care of cats. This island wa hit by Tsunami on March 11th, 2011. But now almost everything is same as before 311 and all the cats are there. If you love cats, this is a good place to visit. You can take a ferry, Amichi-line(網地ライン）, from Ishinomaki-city　and get　off at Nitoda(二斗田). Sendai is the largest city in Tohoku and hence its main transportation hub. Sendai's airport serves domestic and some international flights. The Tohoku Shinkansen connects Tokyo to Sendai and points north. Gyu-tan — grilled slices of cow tongue with salt or miso are traditionally the famous dish in Sendai. On the second floor of Sendai Station, you can find several restaurants dedicated to this local favorite. Sushi — There are many sushi restaurants in Sendai and coastal locations. Zunda — Sweet mashed young soy bean paste, generally offered as a mochi or dango topping, but as a local specialty, is also available in some locations as an ice cream, cake, and jam flavor as well. Hatto — a special noodle soup only usually available in select towns of Miyagi, such as Tome and Kurihara. The noodles are larger and denser than other kinds of noodles, served in soy sauce or miso-flavored soup alongside vegetables. Shark fin soup — A popular coastline special, especially renowned in Kesennuma, but reviled the world over for its unsustainability and the appalling cruelty involved in its production (sharks are routinely de-finned and tossed back, alive, into the water). Public opinion is, fortunately, beginning to turn against the trade of shark fins. Aburafu-don — Similar to the gyu-don found elsewhere in Japan, but features the local specialty of abura-fu. Lower in calories and with an appealing texture, it's definitely something to try if you are a lover of gyu-don, oyako-don, and all those other -dons. There are excellent sake brands, namely Urakasumi and Ichinokura, but there are also plenty of other sake brands. This page was last edited on 29 May 2018, at 08:19.